This Girl Can is back for its second phase. It is a hugely successful programme that looks to help women overcome the all too common fears and hang-ups that prevent so many women and girls from joining in. As part of its relaunch, it has rolled out women only This Girl Can Swim sessions. Low impact and yet working near enough every muscle in your body, swimming is widely regarded as one of the very best forms of exercise. The relative lack of necessary kit and equipment makes it attractively affordable, and yet it can still be a daunting proposition for many women. Some swimming kit can quite understandably make a woman feel as if she is standing in front of a bunch of strangers in her underwear, and the This Girl Can Swim sessions aim to remove as many of those type of obstacles as possible. So at This Girl Can Swim, you wear what’s comfortable for you. Literally whatever you like. It might be a pair shorts and a t-shirt, or whatever cossie you feel relaxed in. No-one’s judging anyone at these sessions. It’s all about you being in the water and reaping the physical and mental benefits. Pilot sessions have been rolled out to selected pools nationwide, and while the same fundamental principles will apply across the board, some aspects – including price – will vary slightly. A session at Swallows Leisure Centre in Swale, Kent – for example – will cost just £1.50. And the sessions at other centres, including Ealing, Harrow and Brent, will be specifically set up with modesty curtains, music and robe hooks for your convenience – as well as vanity units in the changing rooms with hair dryers for after your swim. All-female support staff will be on hand from your arrival to poolside, and many centres will provide free tea and coffee afterwards for a bit of social and a chinwag with the girls. For more information and a full list of participating pools and leisure centres, check out http://www.thisgirlcan.co.uk/activities/swimming/ and get involved! KUDOS passionately supports and encourages women from all backgrounds to get into swimming. 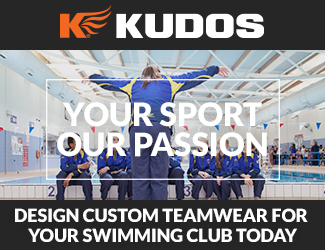 KUDOS custom swimming kits are designed to cope with the rigours of the sport, in matching styles across all garments – including swimming team tracksuits, swimming kit, team hoodies and more.